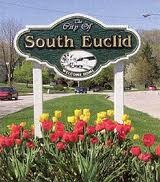 Under the direction of the Charles F. Brush High School Art Department, students will be creating a permanent mural on the Mayfield Road bridge over Euclid Creek, near the South Euclid-Lyndhurst Library at 4645 Mayfield Road. The students will be installing the mural on Monday, May 20th from 10:00 AM to 2:00 PM. The mural is entitled “Walks of Life” and features scenes created from stencils which depict the many different types of people we see everyday on Mayfield Road. The mural design work took place on the school grounds of Brush High School during Photo Club and Art Club under the direction of art faculty members Ms. Hadley Conner (Photography Club Advisor) and Ms. Sarah Curry (Art Club Advisor). The mural is a collaborative project between the City of South Euclid and South Euclid-Lyndhurst City Schools. It marks the second work of public art the City and Schools have installed on the Mayfield Road Corridor. The project is funded by a grant from the Legacy Village Lyndhurst Community Fund. For those wishing to photograph or take video of the project, parking will be available at the South Euclid-Lyndhurst Library lower lot, 4645 Mayfield Road.